Good job Gazz, your eyes are bleeding. Interesting that Natalie can't be detected. So, can he see Ciel? I'm guessing not as she's just a voice in his head but if she has some sort of magical signature and people can see her things might get interesting. Or maybe just awkward. Kinda impressive all the same. It is the first time someone has managed to spot Noah spying on them. I guess it helps, that he is managing spirit sight, without being able to project himself. @Alcemon I don't get where you're getting that from. It sounds like he's not getting much detail at all. He can't even tell for sure that it is Noah. I'm pretty sure Gazz is just much worse at it than Noah is. Also - what is with Natalie? Spit it out, Ciel. I need to know. I think he forgot the spiritually part of pushing his eyes out of his sockets. Natalie remains undiscovered. The way she split the magiball into a bunch of little balls that one time shows that she interacts with spirit in a really strange way. It's probably why she can't be detected (or perhaps, she *can* but it would be dangerous for the detector; having your astral projection be split up in tiny pieces like happened to the ball sounds like a bad idea). Anyway, Noah, be a cool dude and give Gazz some pointers on how to do this because whatever he's doing right now is probably not healthy. Noah's sure a sight for sore eyes. Gaz, chill out bro. This is not worth eye-bleeding over. I don't know how Gazz has recognised Noah in his chibi form. I suppose it's the voice, mainly. So while everyone's trying to utilize spirit, Gazz over here just goes Superhuman - which mainly entails spiritsense and yellow, bleeding eyes! Noah. The important thing is not if Gazz can see him, but rather: Can Gazz see that Noah is a chibi? I wonder why Gazz's spirit changes from light blue to blue. Is he using less? because it also seems to have dimmed a bit. I suspect the reason Natalie can't be detected is because she's not actually there. The Natalie that's present is simply a copy or avatar or something made with the real Natalie's powers and has no spirit at all. 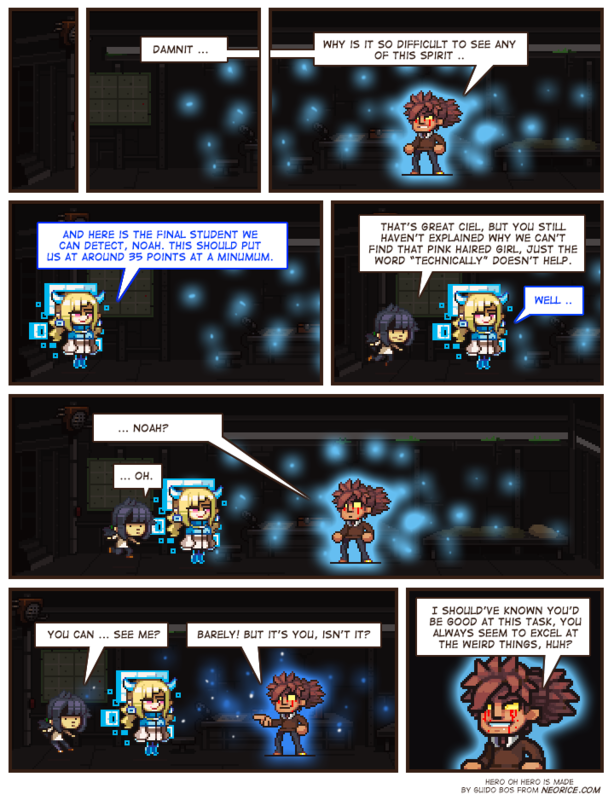 This would explain why Natalie has never demonstrated spirit ability in the class: in the form she can't use it, and why Ciel says "technically": because there are indeed two students left to find, but one of them isn't any of the bunkers to begin with.